This essay will analyse and discuss how experiential or phenomenological approaches assist in an interpretation and understanding of the significance of monuments in the Neolithic by exploring how it is possible, through undertaking phenomenological sensations, an enhanced perception of a site and the awareness of place and consciousness of the surrounding landscape, may possibly be achieved through bodily and physical senses. Phenomenology is a theoretical approach in the understanding of which people experience, create and inhabit the world (Darvill, (2008), 344) and the relationship of being and being in the world and also the relationship of space and place (Tilley, (1994), 11, 14). Phenomenology is a study of human essences of perception and consciousness through thinking, movement and awareness (Merleau-Ponty, (2002), vii-viii). Martin Heidegger in his 2011 publication, ‘Being And Time’, is a method to ‘manifest’ or to ‘reveal itself’ (Heidegger, (2011), 50-51). Phenomenology is also of human consciousness and self-consciousness of conduct whilst experiencing their surroundings within the world (Merleau-Ponty, (2008), 9, 23). Phenomenology is to experience and to obtain an understanding and interpretation through sensory perceptions. Human behavior is characterised through the senses and of touch, smell and sight and can possibly be utilised to acquire a closeness of a monument, location or object (Heidegger, (1962), 130). Through these senses, the colours, sounds and aromas can be heightened to expand the imagination and consciousness of what is perceived (Merleau-Ponty, (2002), xi) through the relationships of monuments, landscapes and buildings and their power and ritual within the world, of which is sensuously experienced through the human body (Fleming, (1995), 1040), however, each person’s perception and understanding contrasts significantly because every person’s interpretation is different (Tuan, (2011), 148). In the Neolithic period, stone was of a special significance and was used to create and display important architectural features of monuments, tombs and standing stones(Darvill, (2010), 122). This is a possible indication for a significant respect for sacred traditions and the monuments symbolism within the landscape (Pollard, (2002), 26-27). The locations of Neolithic monuments within the landscape possibly represents human behavior and the relationships of monuments, natural waterways and prominent hills or mountains (Fleming, (1995), 1040), suggesting these locations were regarded as sacred places and contain religious, political and ceremonial activities (Garwood, (2011), 9), (Daniel, (1973), 240), (Fleming, (2005), 921). The locations of Neolithic monuments within the landscape were possibly associated with the alignment of the seasonal rising and setting of the sun, moon and stars. They were possibly used in ritual activities and were regarded as spiritual or mystical dwelling places (Cummings, Whittle, (2003), 255, 257). Many Neolithic monuments display ceremonial routes where ritual processions or events possibly occurred (Malone, (2006), 186-187). Processions were possibly undertaken for religious activities and also a possible requirement for social and territorial order (Lewis-Williams, Pearce, (2009), 246-249). Neolithic monuments were also possibly observed as monuments of influence, power and fortune. Their locations were familiar landmarks within the landscape and it is conceivable, people used these landmarks to identify their location and physical position within the world (Edmonds, (2002), 33). However, through time, architecture and monument significance transform to possibly contain different implications and meanings in different eras (Kus, (1995), 204), therefore, it is difficult to interpret for sure the uses of Neolithic monuments and landscape because there is insufficient evidence and also very little is known about the Neolithic period to be confident (Bradley, (2003), 64). Experiential or phenomenological methods include a person’s action, memories, perceptions and fantasies with vigilant descriptions and observations (Pickles, (2009), 62-67). Phenomenological and experiential methods are undertaken at a site of a monument and its landscape, this method will possibly support an understanding of the site by perceiving how the monument is situated and its size, texture and any art in the form of carvings. To experience a site personally, this provides a perception of meaning and a greater comprehension than any illustration or description from a text book (Thomas, (1999), 48). A visit to a site permits a new interpretation by walking through a monument. It is possible to sense an awareness of how a person’s behavior changes by stooping through a doorway, a smell of inside a tomb, the sound of echoes and the touch of the walls and carvings (Tilley, (2004), 223). The body will also become aware of the changes in the landscape whilst walking around the monument, of a view below, if at the summit of a hill or a stream or river close by, to perceive the monument within its landscape and the relationship to the outside world. The powers of Neolithic ancestors are possibly sensed from this experience (Tilley, (1994), 204-206). Merleau-Ponty suggests in his 2002 publication of ’Phenomenology of Perception’, that to perceive a visible ‘thing is first hand evidence’. Any epistemological presupposition would cease and sentiment and perception of interpretation, understanding and idea will transform into truth (Merleau-Ponty, (2002), 459-460). Martin Heidegger suggests in his 2011 publication ‘Being And Time’, that ‘Being There’ alters a state of mind and understanding (Heidegger, (2011), 208-210). Merleau-Ponty suggests in his 2002 publication of ‘Phenomenology of Perception’, through bodily senses it is possible to sense another person and to perceive this person differently from a ‘normal persons perception through a sixth sense or hallucination’. Through the experience of seeing, the landscape emerges into life and the identity of an object is disclosed. The power of the ‘stare’ will reveal details of the object for exploration. Awareness is the movement of the body and consciousness and contains a ‘power’ to unite experience and sense information into an identifiable perspective. Bodily experience is a perception of an object through the awareness of space and the experience of the body’s existence in this space. The phenomenological method is to unite all senses to communicate with the recollection of smoothness, hardness, light and dark to evolve into a sensory power (Merleau-Ponty, (2002), 38-39, 77-78, 139, 171, 370). Martin Heidegger suggests in his 2011 publication ‘Time And Being’, to establish the methodof phenomenology, assertion is required to establish an object to be ‘seen from itself’, ‘predication to define the object and communication to relate the object’s character to others’ (Heidegger, (2011), 196-199). On visiting a burial site, the modern visitor will perceive a possible circular mound containing a stone chamber lined with enormous stones, however, by utilizing phenomenological practices, it is possible to interpret the chambered tomb and perceive it differently. Experiential or phenomenological techniques are possibly useful whilst walking the landscape of Tara near Dublin in Ireland, (see Figs. 1 and 2). Fig. 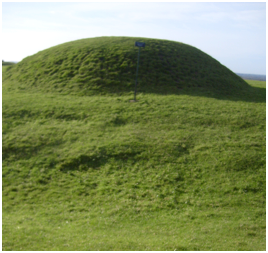 1 A Neolithic burial mound at Tara (Photograph taken by Author 28/10/11). Fig. 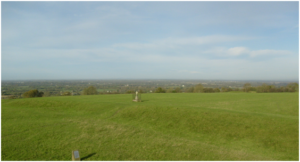 2 A view from the top of the burial mound illustrating the landscape of Tara and its relationship of a prominent hillside within the entire landscape (Photograph taken by Author (28/10/11). A visit was undertaken to the site of Tara on Friday 28th October 2011. This site contained many archaeological features dating from the Neolithic period through to the medieval era. The site contained a Neolithic burial mound comprising a burial cell and large banks containing a ceremonial procession (see Fig 2). Using the phenomenological methods of perception, smell, sound, awareness and all senses, it is possible to interpret this feature in Fig. 3 as a procession whilst walking its length. At the top of the rise of the hill where the procession unites with the burial mound, the landscape reveals a viewpoint at the summit of a hill (see Fig 2). This view was breathtaking and it became possible to understand why this site was located at that place. It would be impossible to fully understand this site without a personal experience, however, Neolithic monuments are difficult to interpret because most have suffered through the destruction of ‘robbed’ stones, movement, falling and through erosion, therefore resulting in preventing a complete interpretation and understanding of Neolithic sites (Darvill, (2010), 99). Fig. 3 A possible procession feature. This photograph illustrates the height of the banks on each side (Photograph taken by Author 28/10/11). Martin Heidegger suggests that monuments are aligned with each other within the landscape and belong to their place (Heidegger, (2011), 136), Merleau-Ponty agrees with Heidegger by suggesting in the Neolithic world everything had significance, meaning and ritual (Merleau-Ponty, (2002), 471-473). John Pickles suggests in his 2009 publication ‘Phenomenology, Science and Geography’, that phenomenology is similar to ‘humanism and phenomenology, interactionism, surrealism and existentialism are the philosophy of surrealism’ in which challenges to present a philosophical grounding for humanistic work and the human ‘lived experience’, however, Pickles also suggests the phenomenological method is the phenomena of an immediate experience within the lived world, which includes perceptions, fantasies, memories and bodily actions to obtain a vigilant observation and description (Pickles, (2009), 48-49, 62-63). Christopher Tilley suggests in his 1994 publication, ‘A Phenomenology of Landscape’, by using experiential and phenomenological methods, it is possible to interpret the order of the monument or site, its positioning within the landscape, if close to a stream or hill, why the monument was assembled in a particular style, a chambered tomb entrance placed towards a particular sunrise and the tombs and alters were also positioned within a burial mound. It is possible that Neolithic ritual beliefs and traditions were intended for the continual use of many generations of their nature and passage through time (Tilley, (1994), 11-13). The phenomenological practice must confirm an experience by the attention to detail to obtain a full understanding and to provide a memory. The memory of a site unites the knowledge of a site to another, without this knowledge, the experience remains superficial and non-contextual. A visit to a site assists the visitor to achieve a sensibility and feeling for the unique features and elements of a site (Tilley, (2004), 219). A critique of phenomenological or experiential methods are to understand a site through familiarisation, it is a slow continuing process and a person is to learn how to sense and understand it because at the beginning a first impression is possibly misleading and disorientating. A true phenomenological practice undertaken solely is insufficient because this method is to be utilised simultaneously with awareness and interpretation, which is a far superior descriptive exercise. The use of textbooks and research are also required with the use of bodily experiences and reinterpretation to obtain a greater understanding of this practice (Tilley, (2004), 223-224). John Pickles suggests in his 2009 publication ‘Phenomenology, Science and Geography’, that phenomenology is in opposition to science, it presents an essential basis but can not replace science. The separation of mind and body are understood within phenomenological methods and are unsuccessful in providing an adequate description of an experience (Pickles, (2009), 52-53). No two people experience the same whilst observing a site or landscape; a person’s bias, presupposition and ideology have to be taken into consideration. An object can be studied and interpreted as one understanding and a different persons interpretation can be extremely diverse because of a persons prejudice and also the positivity of what was definitely observed and understood because of consciousness, can possibly confuse a meditative state of phenomena (Merleau-Ponty, (2002), 67, 471). Martin Heidegger states in his 2011 publication of ‘Being And Time’, that phenomenology is impossible to prove between ‘a reality of the external world and faith’ and that a ‘severe proof’ is demanded. The phenomenon of ‘appearing’ contains more than one signification; therefore, this method is impossible to declare a successful practice (Heidegger, (2011), 53, 206). People make mistakes and are capable to manipulate circumstances at particular events and circumstances, either unintentionally or deliberately, depending on the selection of what is observed and understood, if any understanding at all is accepted (Lewis-Williams, Pearce, (2009), 272), (Merleau-Ponty, (2002), 5), however, through the assistance of phenomenological or experiential approaches, it is possible to understand the significance of monuments in the Neolithic. In conclusion to this essay, it has discussed many aspects of experiential and phenomenological methods of awareness, space and place, bodily senses, interpretation and understanding. 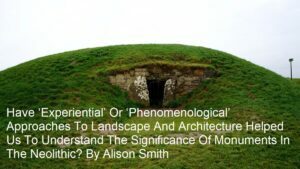 This essay has analysed how it is possible to understand and interpret a Neolithic monument and its landscape by using phenomenological practice. 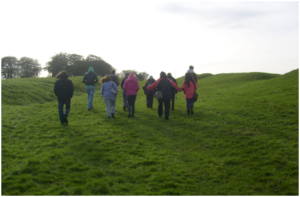 This essay has also discussed various disadvantages of this method, however, by analysing a visit in October 2011 to the site of Tara in Ireland, it was possible to employ experiential and phenomenological methods to understand this particular site. It is possible to suggest this method is conceivably effective to assist in the interpretation of any Neolithic monument or site and its landscape; therefore, yes, experiential and phenomenological approaches to landscape and architecture have helped us to understand the significance of monuments in the Neolithic by studying and using all of the senses whilst walking around a Neolithic site. It is possible to understand their motivation for why a monument is positioned in a particular style and place. Bradley, R. (2003). The Significance of Monuments. On shaping of human experience in Neolithic and Bronze Age Europe. London, England: Routledge. Cummings, V., Whittle, A. (2003). Tombs with a view: Landscape, Monuments and Trees. Antiquity, 77:296, 255-266. Daniel, G. (1973). Megaliths in History. Antiquity, 47:187, 240-241. Darvill, T. (2010). Prehistoric Britain. Oxon, England: Routledge. 2nd Edition. Darvill, T. (2008). Oxford Concise Dictionary of Archaeology. Oxford, England: Oxford University Press. 2nd Edition. Edmonds, M. (2002). Stone Tools and Society. Oxon, England: Routledge. Fleming, A. (2005). Megaliths and Post-Modernism: The case of Wales. Antiquity, 79:306, 921-932. Fleming, A. (1995). A Tomb with a view. Antiquity, 69:266, 1040-1042. Heidegger, M. (2011). Being And Time. Oxford, England: Blackwell Publishing. Kus, S. (1995). Review. Antiquity, 69:262, 204-206. Lewis-Williams, D., Pearce, D. (2009). Inside the Neolithic mind. London, England: Thames & Hudson Ltd.
Malone, C. (2006). Neolithic Britain and Ireland. Stroud, England: The History Press. Merleau-Ponty, M. (2008). The World of Perception. Oxon, England: Routledge. Merleau-Ponty, M. (2002). Phenomenology of Perception. Oxon, England: Routledge & Kegan Paul. Pickles, J. (2009). Phenomenology, Science and Geography. Spatiality and the human sciences. Cambridge, England: Cambridge University Press. Pollard, J. (2002). Neolithic Britain. Buckinghamshire, England: Shire Publications Ltd.
Thomas, J. (1999). 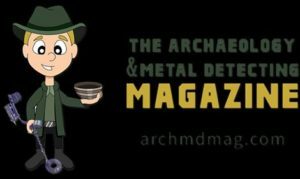 Understanding the Neolithic. London, England: Cambridge University Press. Tilley, C. (2004). The Materiality of Stone. Explorations in Landscape Phenomenology. Oxford, England: Berg. Tilley, C. (1994). A phenomenology of Landscape. Places, paths and monuments. Oxford, England: Berg Publishers. Tuan, Y. (2011). Space and Place. Minneapolis, U.S.A: University of Minnesota Press. 7th Edition.